Authors: Multiple, edited by T. Kanti Srikantaiah, Michael E. D. Koenig, and Suliman Hawamdeh. I would not have bought this collection of individual papers edited into one volume if I didn't have a deep and ongoing interest in project knowledge management. Every organization I have ever worked with used projects to advance their mission. These projects may have been organized around divisions, departments with various names, even "centers" within organizations, but the most relevant unit of analysis from an operational perspective was the project. Where projects dominate as an organizational structure, a key challenge with regards to knowledge management is the development of knowledge silos. Each project can become a small kingdom of its own with minimal knowledge flows in or out. This could lead to perfectly self-sufficient and effective projects (unlikely) but it's not doing much good to the organization in terms of knowledge sharing. That's where the PMO (project management organization) comes in -- assuming there is one. A central feature of a PMO should be to facilitate knowledge sharing across ongoing projects and the documentation of lessons learned at the project level that can be shared across projects. The PMO should also play a key role in making necessary adjustments at the institutional level to ensure that lessons become embedded in policies and processes. For the sake of linking to a previous blog post in this series (The Accidental Taxonomist - Book 2 of 30), one way to organize project knowledge would be to use the 9 (probably 10 by now) areas of project management as described by the Project Management Institute (PMI). In fact, the taxonomy I used at NASA/Goddard to document project management lessons learned used the key PMI topic areas as a starting point and attempted to stick to a terminology consistent with PMI - even though NASA project management has its own well-defined processes and doesn't follow PMI. This book deserves a thorough second reading. Read it again! Carefully read Stephen DufField's just released Dissertation: Systemic Lessons Learned Knowledge Model (aka SYLLK model). 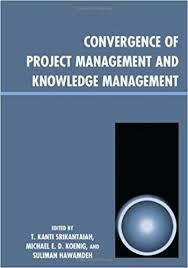 Revisit my bibliography of project knowledge management resources and update as needed.